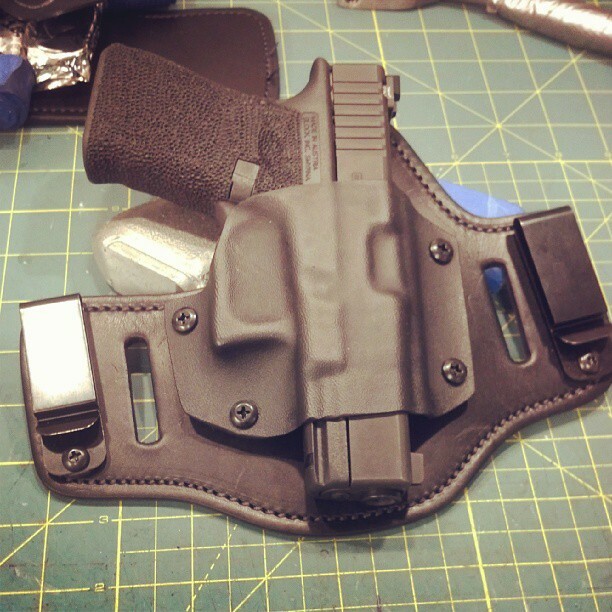 UPDATE: I wrote and posted a gun holster review on the day before the naval yard shooting in DC. It seemed like a poor time, so I took it down. I then had a great conversation with Kristin Wald—proving that people who might come at Big Issues from different places can have a conversation—about the need for rational, responsible gun owners to speak. So I’m adapting what was a gun holster review to be a post on gun safety and children, with a holster review and resource links. I’m not speaking to the idea of laws and what we should or shouldn’t have over us. As it stands, we have the freedom to carry. As long as we have that freedom and guns are around, we should ALL BE EDUCATED AND RESPONSIBLE, whether or not you own a gun or support or don’t support gun control. Let’s start gun safety in our own homes—EVERY home, whether you are a gun owner or not. I am about to step into a minefield. An issue that is so charged politically and ideologically that I’m a little terrified. Never bring up politics or religion at a dinner party, the saying goes. Since I talk at least once a week about faith in Jesus, so I’m already committing a party foul. Add politics to the mix and we are in for it. The thing is? This is my blog, not a dinner party. So buckle up. And I encourage you to sort of pause, if you will, your assumptions and your positions and hard-fought lines for a moment. I know that I did when thinking about and writing this post. Forget how you vote and what paper you read and dive right in here with me, where I am going to attempt to be logical, rational, and also opinionated. One of my favorite childhood movies was Pee-wee’s Big Adventure. I’m sure I’m not alone, right? Tell ’em Large Marge sent ya! The basement of the Alamo! Tequila! Such a classic. I still have a special place in my heart for Pee-wee. Moving here for real, some of those stereotypes are true. I have not tried it, but I guarantee you if I went into a crowded mall and sang, “The stars at night are big and bright…” there were be a weird pause where everyone would drop their shopping bags, clap four times, and finish the song for me. Yeehaw! Some people do wear cowboy hats, I met a few boys who literally (and I do actually mean literally) lived in a barn, their rooms converted stalls next to their horses’ stalls. There are also a lot of guns in Texas. For years now, Rob has had a concealed handgun license. I don’t have one and didn’t grow up with guns, but I learned pretty quickly that if you get your concealed carry license, you are learning an immense amount about guns, their use, the law, and safety. I trusted that Rob knowing was enough. I do trust him and respect his knowledge and ability to handle a gun. But after having a short dialogue with Kristin Wald via Twitter (of all places), I began doing some reading. We have children. We have guns. Is it enough that I trust my husband to take care of this? Do not misread my question. I fully trust Rob to handle guns safely and responsibly. At the same time, I myself need to arm myself (no pun intended) with knowledge about guns. In fact, I’m considering a concealed carry myself, just so I can get some literal hands-on training, plus more knowledge about guns, law, and safety. I read this article in the NY Times and it gave me pause. GREAT pause. If you aren’t a reader (it’s long and disturbing), some of the important points are that many accidental shootings by and of children are listed as homicides, which makes the actual number of accidental shootings higher than they seem on paper. There were many examples in the article of children killed by accidental fire, often by a friend or relative, and these cases spanned all kinds of demographics and even the spectrum of negligence to safety and education. Bottom line: I don’t know that we can ever be too careful when it comes to guns and our children. I am like many of the people in the article in that I think this is a complex issue. I want children to be safe, and yet, I also want our family to exercise our right to have firearms. What does that look like in actual life? I’m not going to get into the legislation side of things, but I will get into the personal side of them. What can YOU do if you want to promote safety for your children? I believe there are two things and they must go together to work effectively. 1. Secure Your Guns. Yes, it may be harder to access a gun if it’s in a safe. But the reality is that maybe we put too much weight on this in terms of our area or demographic. A great question from Project Child Safe is this: Are my safety concerns realistic and consistent with local crime rates? Crazy stuff happens all over the place and in all kinds of areas. That being said, I think it’s a fair and good question to ask for your household. What weighs more heavily—the need to have quick, unsecured access to your gun? Or the fact that quick, unsecured access means your child also might have quick, unsecured access? You may not have guns, but your family members or your child’s friends’ parents might. This might mean that you check to ensure that other people are being secure. Do your other family members have guns? Ask if they are secure. Pass on a brochure from Project Child Safe about safety. Be that weirdo who is overly cautious. I doubt you’ll regret being the weirdo later, but you might regret NOT being the weirdo. 2. Educate Your Family Members. Whether children or adults, if there are guns in the house, be educated. I want to know more about guns and gun safety for the sake of my children. I think it’s important that I take responsibility as well as Rob, not because I don’t trust him, but because I should know. I want my children to have a healthy fear of guns. I want them to understand what to do if they ever see a gun. I also want to remember that they are children and will often do something different than what they are told, which is why gun security is so vastly important. Boys are much more likely to touch or play with a gun if they find one, and as the mother of two boys (who love to pretend fight, whether they are ninjas or transformers), I believe that. I am working to know more myself and for Rob and I to impart knowledge and safety to our children. I believe in both 1 and 2. I think that they need to go hand in hand for the safety of our children. If you only secure and don’t educate, your child might encounter a gun somewhere outside your home and make a poor choice. If you only educate and don’t secure, your child might find a gun and, being a child, play with it. Possibly with fatal consequences either way. The Project Child Safe site has great questions, great resources, AND an interactive map that can link you with local places that have a free gun safety kit. 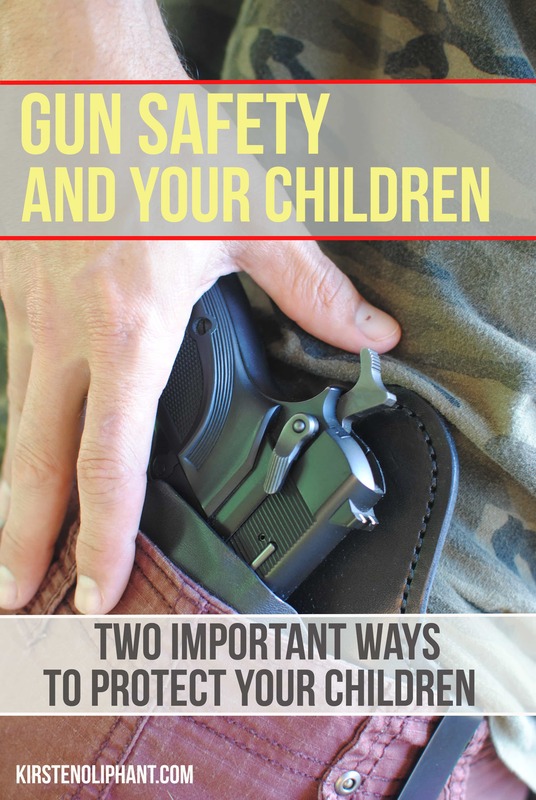 Education and safety for your children starts with YOU, even if you don’t have guns in the home. As long as we have the freedom to carry guns, whether you do or not, I believe we should ALL be educated and responsible. I am working toward this. What about you? For those of you who are concealed carriers, I recently got Rob what I think was a fabulous Father’s Day gift this year: a new holster. One of my high school friends (of Prom Proclamation fame) has a business called Guardian Concealment, making these great leather holsters. I gave him the model of Rob’s gun and he shipped us a beautiful holster. Rob was super excited at how comfortable it is and how well it fits. I was super excited to finally get a great gift for him (I’ve been a terrible gift-buyer lately) and that I could support one of my dear old friends in the process. I like that this one is very comfortable on his skin because of the soft leather, and is safely tucked inside his pants, out of reach of little hands. There is something really attractive to me about a man carrying a gun…who knows all about gun safety, regulations, and responsible ownership. And speaking of safety, carrying a gun on your person in a safe holster means that you know where your gun is. As a special bonus and a bookend back to Pee-wee Herman, click to see a video of Sawyer at 2 dancing to Tequila with Pee Wee. This is awesome! I am always looking or a good, small-business holster. The one I have is OK, but it is not the most comfortable. Your buddy doesn’t have a holster for my model, but it’s pretty popular so hopefully they will add it soon. I will definitely check them out. I grew up in a house of guns. My father and brothers all were hunters. My father has always had a concealed carry. I knew from a very early age that there were weapons in my home, and I knew how dangerous they were. My parents never hid them from me or made me afraid of them. I knew where they were kept, and they were always locked. I knew that my father kept an emergency fire arm near his bed in case of an intruder or other potentially dangerous situations. I knew where that weapon was, and I knew very early that I was not to play with it because it was not a toy. I honestly can’t remember ever having toy guns in our home. Maybe that was intentional to teach that they weren’t a play thing. Maybe not. My parents taught me to RESPECT them and their power. Now, married to a man who is just like my dad, I know that my children will be raised the same. We’ve actually had this conversation already, and we’re not even pregnant. I am not a shooter. In fact, I’ve never even shot a gun. My husband would like me to at least try it, but I’m not sure. Regardless of my skill with a gun or lack thereof, I will raise my children then same way. To respect these things, and to use them (when they are of appropriate age) responsbily. And, thank you for the holster rec. This may be a Christmas present in the making! I like that you had the experience of learning about them from an early age. I think a lot of times, people that grew up with good gun understanding pass that on. Not that my parents DIDN’T teach me, but I wasn’t really around guns, so it was almost a non-issue. I think even for people that don’t think they’ll be around guns, this should be important! Many of the stories of accidental shootings were not at home but at a friend or relative’s house. Also, I wanted to hunt so bad growing up, that I would have NEVER done anything to jeopardize that. Just the way my family worked. OO! I like that option. Thanks! I also have a concealed carry permit, and often carry. I keep my guns and ammunition in a gun safe with electronic keypad access that ONLY I know the code for. This adds maybe five total seconds to the accessibility of my firearm at home should I ever need to get to it in a hurry. Five seconds in an emergency situation may seem like an eternity, but is a more than acceptable trade-off in my mind for that extra layer of security with kids in the house. Regarding children and gun safety, My dad had a .22 revolver when I was growing up. He never took it out, never talked about it, and never taught me how to use it, so I was naturally curious. He never kept any ammunition near it, but it was not locked up, so I would often go look at it, handle it, play with it, etc. I was smart enough to know how to look and see it was not loaded, but still a very dangerous situation, and I do not want my son to follow in my footsteps in this regard. He has his own little Daisy Buck BB gun that is *his* firearm. It is the only one in the house he is allowed to touch (only when an adult is present), and he can recite all the basic safety rules to me at any time (Keep the gun pointed in a safe direction, keep your finger off the trigger until you are ready to shoot, know what is behind your target, do not point your gun at anything you don’t intend to destroy, safety on when not in use, etc.). He is expected to treat his BB gun responsibly and with respect, and if I catch him accidentally slipping on any safety areas, there is an immediate correction. He knows if he intentionally misuses it, it’s gone for good. and he has had it over a year now (proud dad). I often shoot my air rifle in the backyard with him, and he is CONSTANTLY calling me out for “safety violations,” namely not putting the safety on when I’m loading a pellet (oops). It drives me crazy, but I always give him an atta-boy for noticing and encourage him to keep an eye out for anything else I might slip on. Anyway, I’m sure I’m not perfect, but I try to do everything I can to secure my firearms and educate my kids, for not only their safety, but everyone else’s as well. That’s just how I do it. You may not agree with me, but I just thought I’d share! I like hearing how people handle things so I appreciate you sharing! I like when people are proactive. Sounds like you are doing a great job. I was maybe twelve, playing with some other kids from the neighborhood, when one of them grabbed my father’s double-barrel twelve-gauge out of the attic closet, cocked both hammers, stuck it in my neighbor’s chest and pulled both triggers, shouting “BAM! BAM!” He had never even cracked the breech, so he had no idea what was in that gun. That’s my most memorable lesson about kids and guns. THAT IS SO TERRIFYING. And I love the way your dad taught you about the shotgun. It’s going to stick with me, and I’m just reading about it. Thank you so much for the great review and for addressing this very important topic. With small children gun safety is the most important thing. It is very hard to beat a non-electronic kaba lock like the one used in the Fort Knox pistol box. They make an amazing product that will not fail and is very fast. I currently use a gunvalut and plan on switching to the fort knox. Kirsten — thank you for deciding to republish this! It’s an important topic, and sadly it’s something that too many people feel uncomfortable discussing. Asking a friend or neighbor or father-in-law if they keep firearms stored and locked away needs to become part of normal and natural conversation. And thank you for pointing out the higher likelihood of boys being involved in unintentional shootings. Having worked with children teens for 20+ years, I can tell you that for many, “Don’t touch” isn’t enough. It’s not enough with chocolate, alcohol, cash, make-up…and it’s not enough with firearms. Thanks! It is a weird topic and I felt weird writing about it. Appreciate your reading and insights. I think I remember hearing we had a gun in the house, but never saw it, so great job keeping it away from us! 🙂 I don’t know about legislation and can’t really speak to that. Thanks for reading, Dad! Having moved over to the US just two years ago from Australia I still find the whole guns in society phenomenon quite strange!! I spent a semester in England and it was really different to be in a culture that had no guns. Columbine happened while I was there, so getting to sort of experience it through my own lens and that also of the English students around me was really eye-opening. I can, because of that, understand how weird this must seem. It was also very strange to be in a different place and get a sense of what it would have been like to grow up in another culture. I feel you, Lehane! Guns will always make me nervous. However, after listening to Wikinomics, I now know that, statistically, backyard swimming pools are more dangerous to children than guns in the home. Thanks for sharing this! People have to understand that guns are somewhat necessary for protection and personal safety. I live alone in a not so safe part of town and I feel much more secure knowing that I have a weapon in case anything happened. My father had several guns, and my parents have six children. They always were to sure to make sure that everything was locked up and that guns were not accessible to us as children. You have provoked a lot of thought Kirsten. I don’t like guns so I definitely believe in gun safety. Great post! Wow! That looks like a good read! Thank you for this! Gun safety is so important! I have grown up around guns, pistols, any sort of firearm, you name it, my dad had it locked in his gun shed and my brothers and I knew what they were, what they were for, and we had a sense of respect for what we knew was a very powerful weapon. This is such a great post and I think all families who own a gun should go over these important things with their kids. I agree, you can never be too careful when it comes to gun safety and children. And its really important to educate the whole family and not only just kids about gun safety. My dad had guns growing up and he tough us at a young age about guns and gun safety, which was very helpful growing up. Since gun can be dangerous sometimes so I think not only the children but also the whole family needs to know the gun safety things. Thanks a lot for sharing. These are great points! 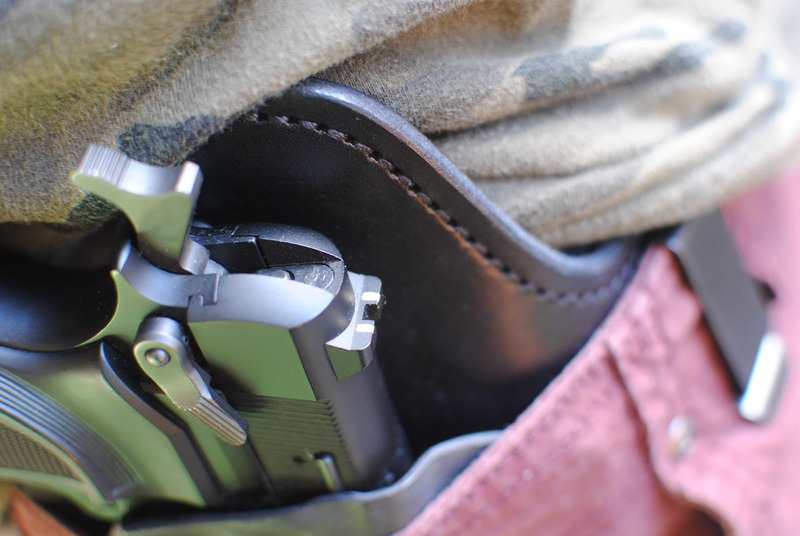 Knowing where your gun is located, whether in a holster or in a safe, gives you the peace of mind that it’s not being mishandled and that, if self-defense is needed, you have secure access. Thanks for sharing! Education about guns and gun safety is crucial! Great post, thank you for sharing! Having a gun takes a lot of responsibility. I agree education is very important. My father has been thinking about taking my nephew’s deer hunting soon. I think it might be smart for him to have them learn how to shoot a pistol first. It is good to know that it would be smart for them to think about getting them educated well before letting them shoot the gun. Thanks for your post. Totally what I’m looking for my research about children guns safety.